Background Information: Matthew is a 19-year old male born and raised in Los Angeles, CA. Both of his parents are Jewish. Context: Matthew shared this story with me in a conversation about holiday traditions with our families over coffee. Analysis: Growing up in a Christian home, it was very interesting to gain an understanding of a cultural tradition, that for me, is unfamiliar and never personally experienced. It led me to think about my own traditions with reference to food and the meals my family will consistently have year after year for specific holidays or events. 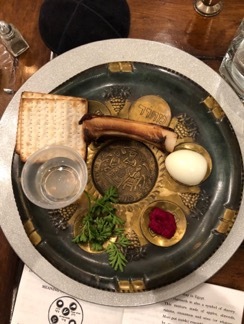 Attached is a picture the actual Seder plate Matthew’s family provided at Passover dinner this year (2018). Background: This was a very interesting story for me to hear because I know the story of Passover from the Catholic viewpoint but have never really understood the specific Jewish traditions of Passover, and this was one example with which I was not familiar at all. This is an interesting symbolic touch added to the dinner, which, in my opinion, provides structure to the dinner and increases the level of reverence associated with the dinner if a real object or real food is dedicated to a holy person. I can relate to this because during Catholic mass the most important part is when the bread and wine are supposed to become the body and blood of Jesus Christ, and this tradition creates more respect for the ceremony when we dedicate such an intense belief to a weekly ritual, a characteristic I see reflected in this tradition of Elijah’s Cup. This interview was conducted in person as the informant lives down the hall from me. This story is important to the informant because she conducts this part of the ritual every year at Passover. The informant is a 66-year old mother, step-mother, former poverty-lawyer, property manager/owner, and is involved in many organizations and non profits. She was born in the Netherlands and immigrated to the United States with her family when she was four years old. She grew up in California, where she also attended college and law school. She lived in the suburbs of Chicago for a short while with her husband and family, and now they live in Pacific Palisades, California. Informant: “Back when I was a kid, with your Opa [the word for “Grandpa” in Dutch] every Passover, we would leave a glass of wine—in our most ornate wine glass—for Elijah, like we do now, but we would also all go around the table after the meal and have to tell a little anecdote about Elijah. I’ve participated in the Elijah ritual myself, so I can speak from a first-person perspective as well as commenting on my informant’s information. In my opinion, leaving a glass for Elijah symbolizes hope, for the future and for the Jewish people—a people historically oppressed and systematically pushed down. Leaving a glass and/or opening a door for the prophet, Elijah, to come is a way of leaving the door open to positive things to come. As it is a prophet that the glass of wine is left for, this custom can also be seen as a seeking of knowledge or insight. This is a tradition practiced by my informant every Jewish New Year, in Paolos Verdes. This is a version of the Jewish tradition tashlikh, in which Jews cast bread into the sea to symbolically cast aside their sins from the previous year. It is inscribed in a passage in the book of Micah, 7:18-20, which states “You will cast all their sins into the depths of the sea”. The use of letters and sharing would ensure careful thought and consideration, both personally and among the entire family. The substitution of rocks for bread could be for the ready availability of rocks on a cliff face, but it also might be more healing to throw something heavy as symbolic of sin.